The C3 standard (bench seat), D3 standard (bucket seats) and F3 deluxe (bucket seats) interiors for 1966 called for an all parchment interior with burgundy accents. 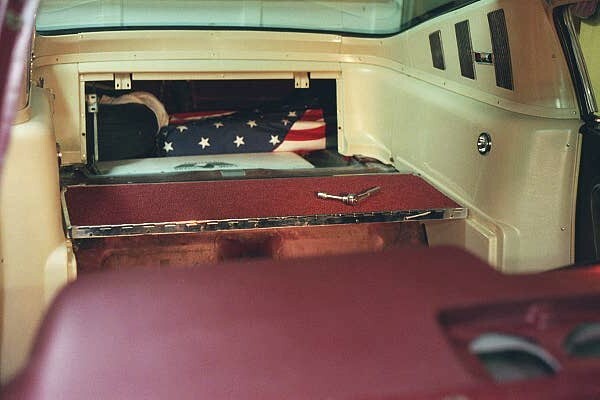 These accents consisted of the dashpad, speaker grille, lower windshield mouldings, carpet, folddown seat carpet and curved seatback panel (fastback models), and seat belts. Everything else was parchment. Either burgundy and maroon were used as the name of the color depending on which part of the car one was talking about and who was supplying the part. The background on this web page is a scanned picture of a piece of the 1966 maroon (or burgundy) carpet. At first, you would think it red until you compared it with a sample of the red color used in 1965. The difference is obvious. 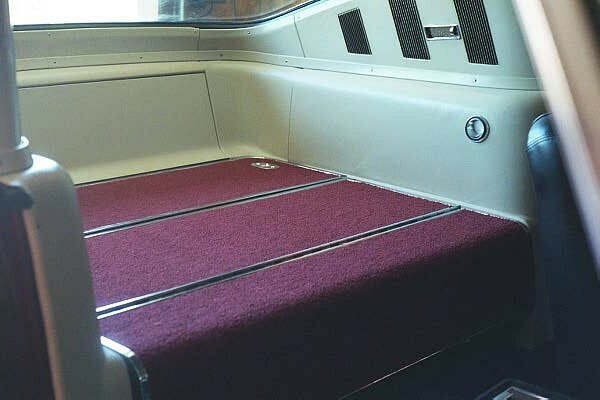 This carpet was also used with interior codes 25, 35, and 65 in the1966 all red interior. Because of the work involved and the amount of funds available, I elected to replace only the folddwon seat carpet at this time. Main carpet will be replaced later. The console was also left as is (black) until the rest of the interior is restored. A shot taken through the windshield opening (without the windshield) showing the dashpad and the first rear seat panel reinstalled. This is the panel that mounts the seatback and has the two body hinges. This panel has to go in first because it's is aligned against the lower quarter trim panels, and all the other floor pieces mount off of it. This picture was taken using incandescent light for illumination. Here the load floor (aft) panel is installed. Outside light was used for this picture. Note also that the trapdoor is also installed and aligned with the striker plate on the floor. Dimly visible in this picture is the upper garnish moulding, headliner and coat hook. The completed fastback folddown seat. This picture also gives a good view of entire completed back of the interior for D3 and F3 interiors (C3 interior was not available in fastbacks). 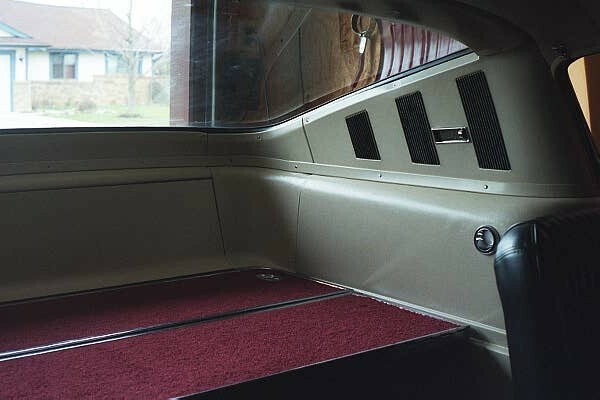 Not visible are the two small pieces of carpet that are glued to the front lower edges of the lower quarter trim panels. When the rest of the carpet is replaced and the console refurbished, that process will be documented here.